Please refer to our stock # TI10028 when inquiring. I think there is only one word to describe this necklace and that is magnificent. First of all it is huge -a choker 15" long with a 4" extender and the center front of the big is 6" long. 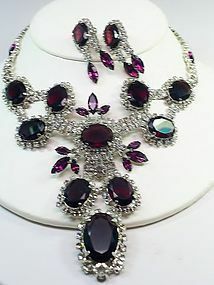 The amethyst stones are huge also and perfectly set off with the clear in rhinestones set around them. The metal is silver chromium plated, and the set is in excellent condtion. It doesn't look as if it has ever been worn. The earrings are 1 1/" long and have the same stones as the necklace. The set is not marked.